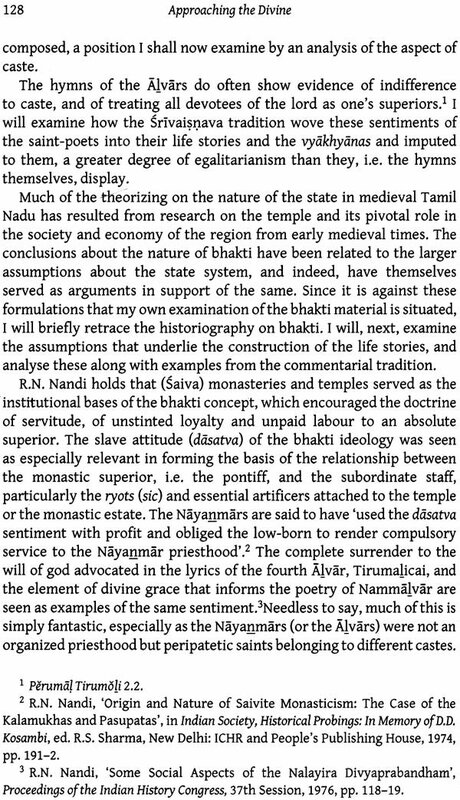 Approaching the Divine: The Integration of Alvar Bhakti in Srivaisnavism is situated in the context of the ongoing scholarly debate regarding the historical evolution of Tamil Srivaisnavism. This study spans the period from the second half of the first millennium, i.e. 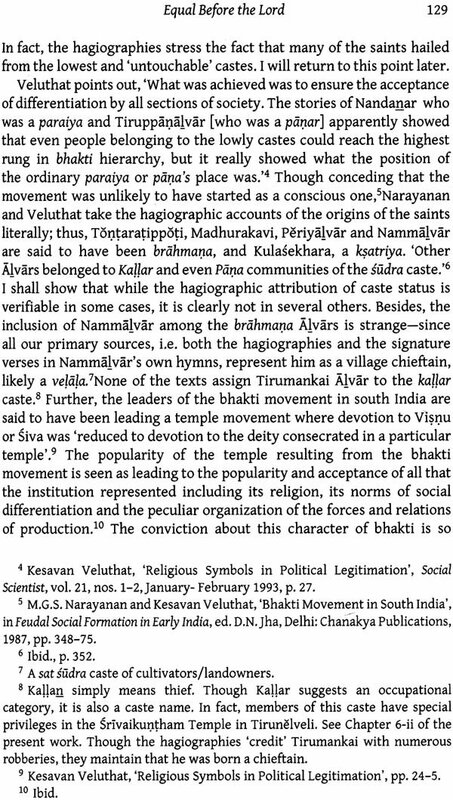 the bhakti period to the period of consolidation of the scriptural and sectarian tradition in the first half of the second millennium, the lives of the bhakti saints have been used to understand their hymns. 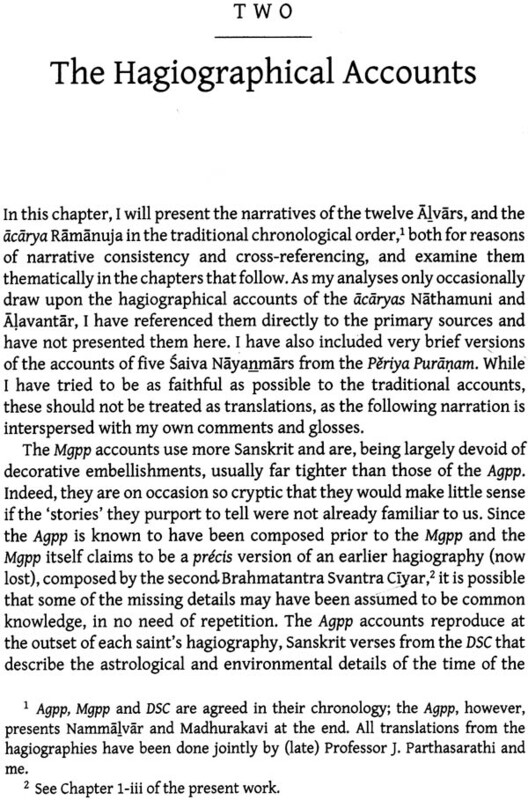 Examination of these hagiographies through the lenses of theology, caste, sectarian conflict and popular legends, however, suggests that these life stories might themselves be constructs of the latter period, and are governed by socio-economic and political impulses as much as by spiritual ones. 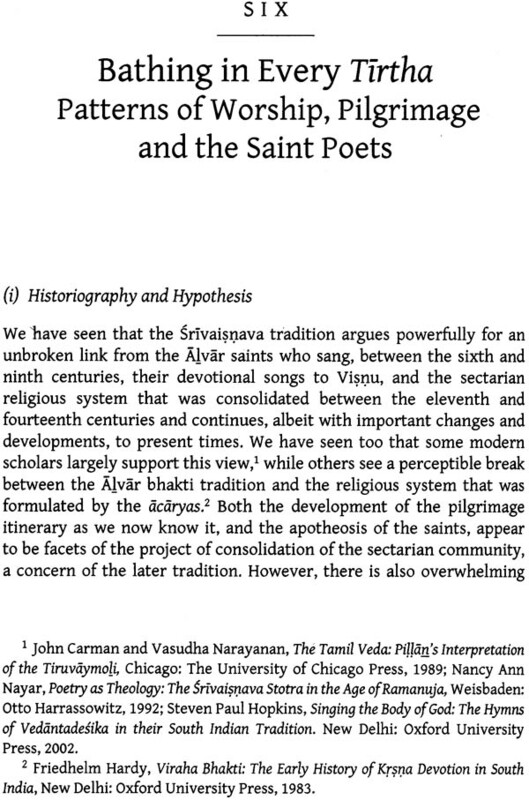 This work attempts to trace the process whereby Sanskritic brahmanical tradition and a devotional Tamil folk tradition were knit together, arguing that ways in which the saint-poets’ hymns were interpreted and integrated contained elements of both continuity and change. 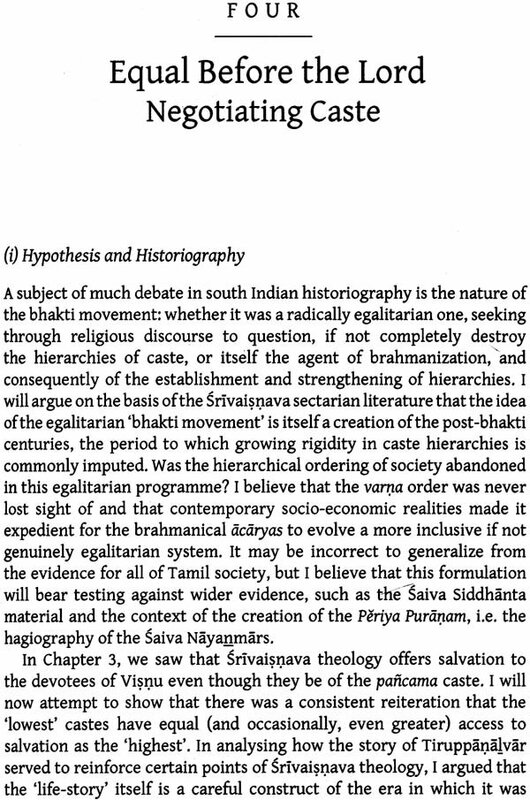 Bharati jagannathan teaches History at Miranda House, University of Delhi. She writes fiction and poetry, and has authored several children’s books. but not the Dark One. and the cows are frisky. This could well be a classical love poem from the Sangam Tamil collection, Akananuru, the poems of the ‘interior landscape’, made familiar to us by A.K. 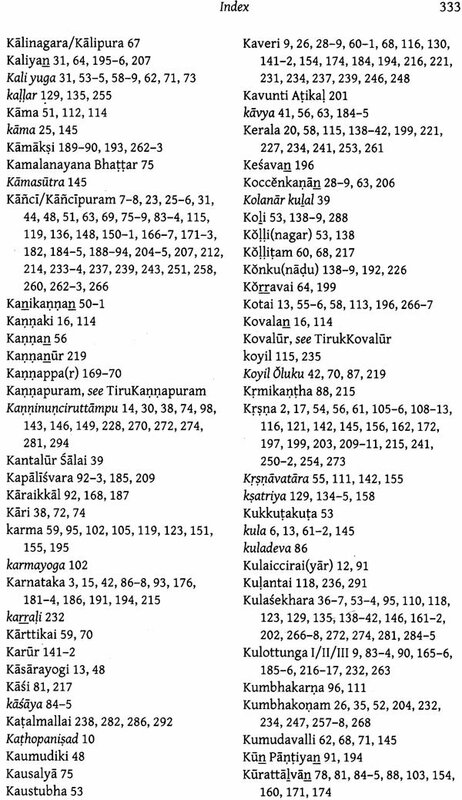 Ramanujan’s excellent translations. 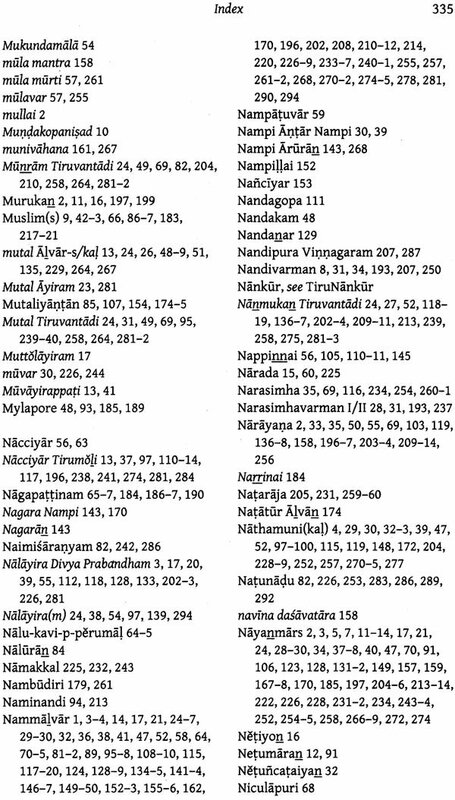 And it does share many features with the poem of that anthology-for one, this poem is also originally from Tamil, and has also been translated by Ramanujan. Though the similarity does not end there, it is actually a product of careful reworking of the older idiom, the established conventions of sangam poetry, to convey a new sensibility. This new poetry a cardinal rule of the akam genre-that none of the protagonists be named. For here, the beloved, the one causing the heroine the sufferings of love-in-separation, is as in the puram genres, identified, as The Dark One. And to the initiated, this clue tells all-it is not a generic dark lover but the Cosmic Lord who swallowed the seven world and then lay as baby on a banyan leaf; who smote the demon Hiranyakasipu as a man-lion; who killed Ravana in his avatara as Rama; who, as krsna, held aloft the mountain Govardhana as an umbrella to protect his cowherd community from torrential rains; who sleeps on the hooded serpent in the milky ocean, and in Srirangam. He is also Mayon of classical Tamil, the dark lord of the mullai tinai, the pastoral landscape. 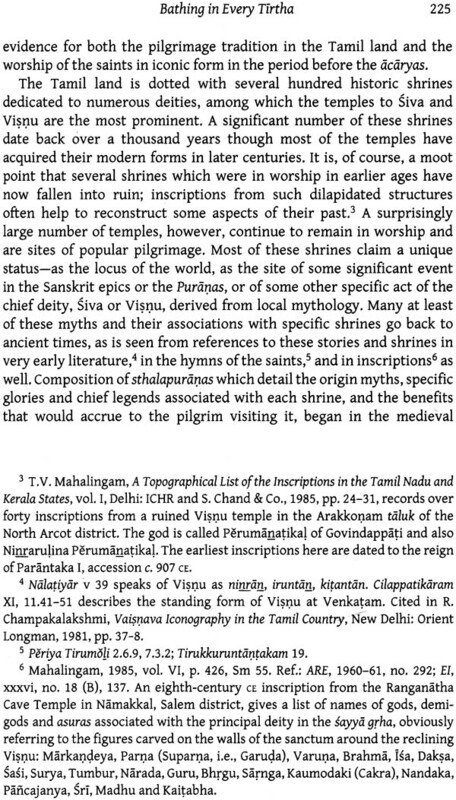 Mayon or Mal of the Sangam poems already exhibits features of the northern Krsna; in fact, it is difficult to alwaya tell which elements of the composite god are Dravidian and which draw on northern sources. 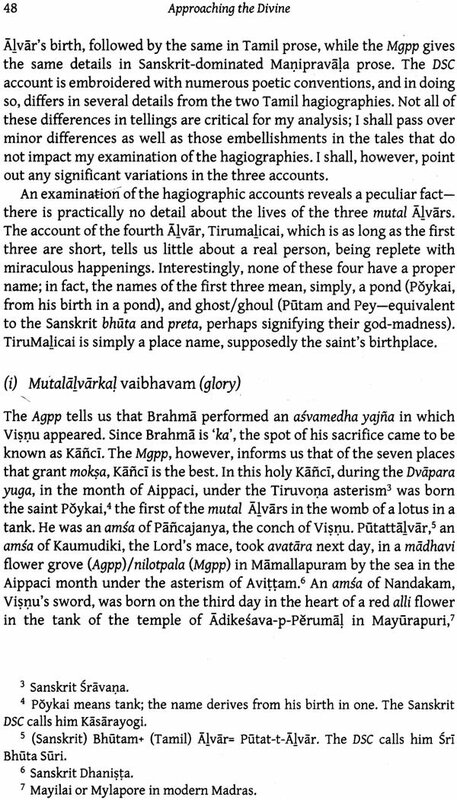 His early identification with krsna, Visnu, and, indeed, with Narayana, the supreme aspect of Visnu, in the Cailappatikaram, a late Sangam text, must certainly own to northern influence. But a more important element from our point of view was the lacalization, the ‘fixing’ of the transcendental god. 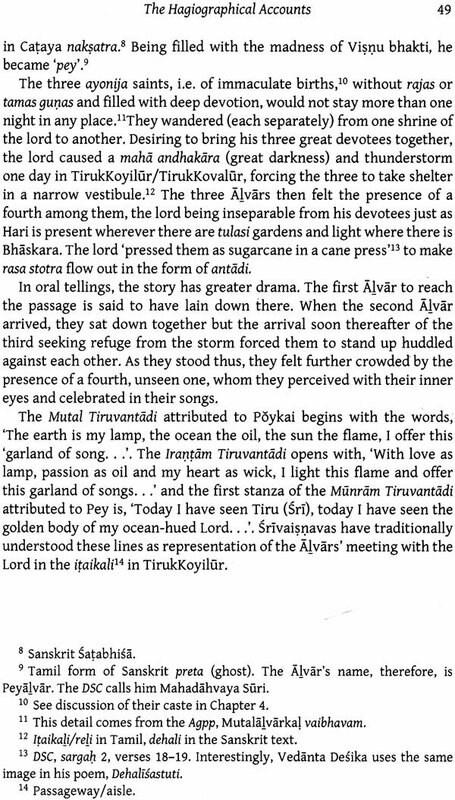 ‘The universal god becomes a personalized god, almost “Visible”, his presence must be tangible, almost physical, “here and now”, contrasting with aniconic Vedic worship....A person with whom one may enter into an individual, highly personal, intimate, exclusive relationship and close contact.’ The immanence of the deity in the landscape-Murukan/Ceyyon in the kurinci tinai and Mayon in the mullai-that seems to have been fundamental to the Tamil ethos, and the relationship with this rooted deity, were this deity, were to become significant for the trajectory of development of religious ideas in early medieval Tamil Nadu. The sixth to ninth centuries CE in Tamil Nadu saw the emergence and flowering deeply devotional form of religion which, as it acquired a distinct character, came to be called bhakti. 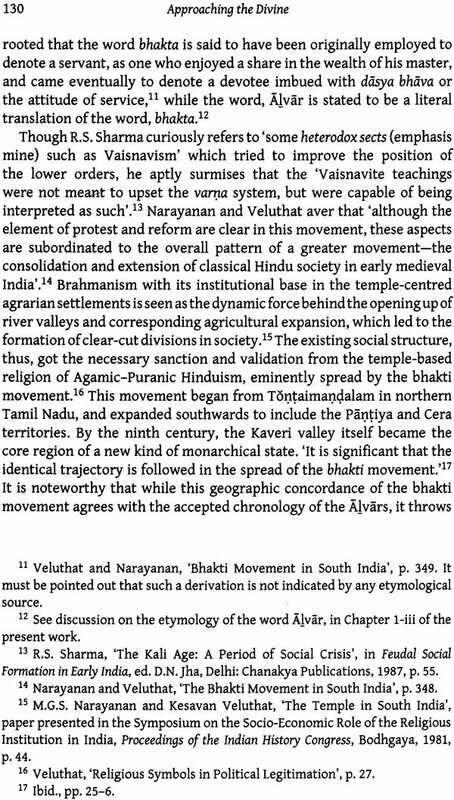 Bhakti devotionalism which was eventually to become one of the most important aspects of the religious landscape of much of the subcontinent was focused was focused primarily on either of the two gods, Siva and Visnu (or his avataras), who came to be elevated far above the rest of the fairly extensive contemporary pantheon, and indeed above each other, in the minds of their respective devotees, The Saiva tradition recognizes sixty-three saints called Nayanmars, while the Vaisnava tradition reveres twelve Alvars. 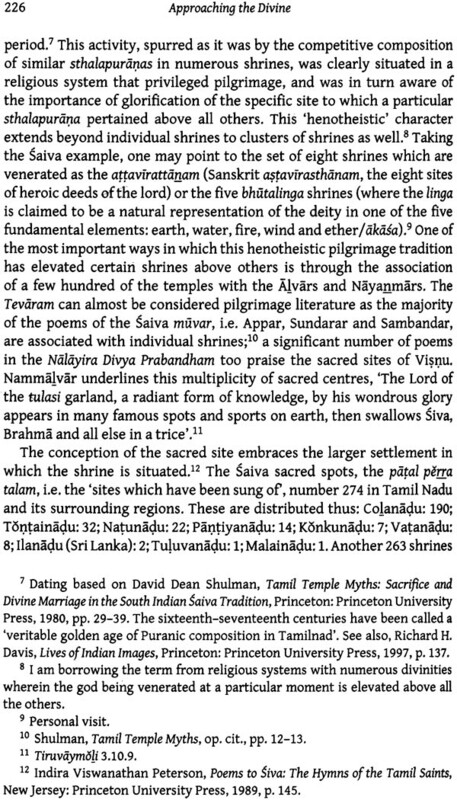 While many of the Nayanmars may have been legendary, since only a few have left behind compositions, the twelve Alvars have usually been thought to have been historical figures, as there are hymns attributed to all of them. 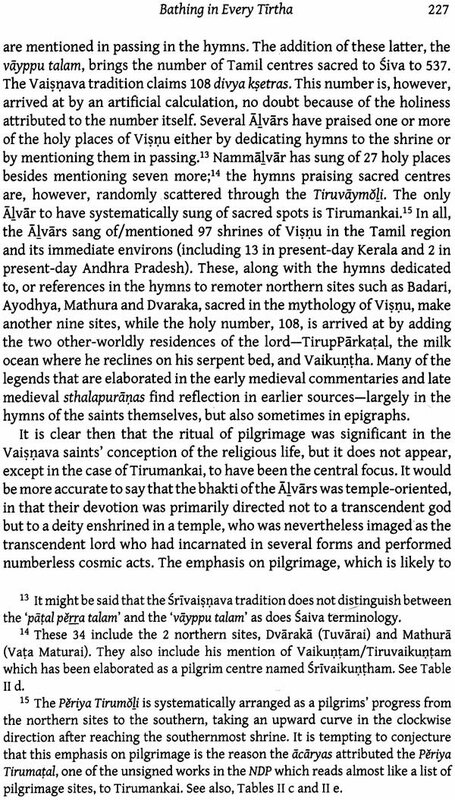 The Srivaisnava community based largely in Tamil Nadu and in Parts of Karnataka and Andhra Pradesh Venerates the Alvars as saints and devotees per excellence of Visnu. 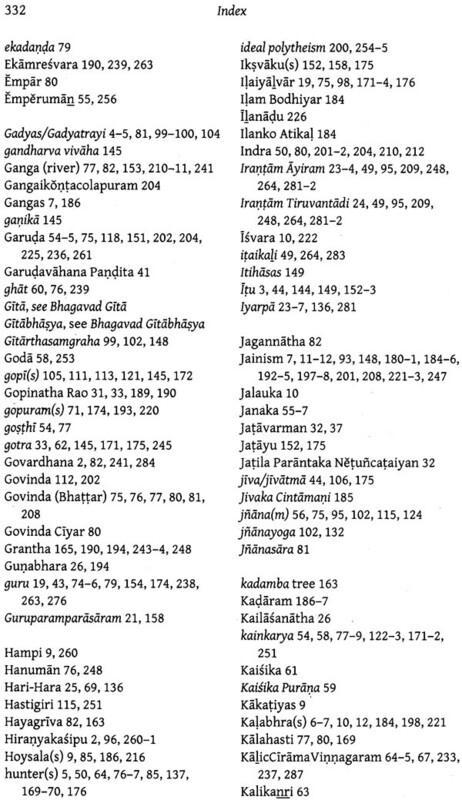 Needless to say, Visnu is the supreme godhead for the Srivaisnavas who designate themselves so, first, in order to distinguish themselves from other Vaisnava sects and second, because of a crucial theological belief in the inseparability of Visnu and Sri, the latter signifying both the god’s sakti and the mediatrix between the god and his devotee. This theological position was elaborated between the eleventh and fourteenth centuries by brahmanical acaryas. 5. 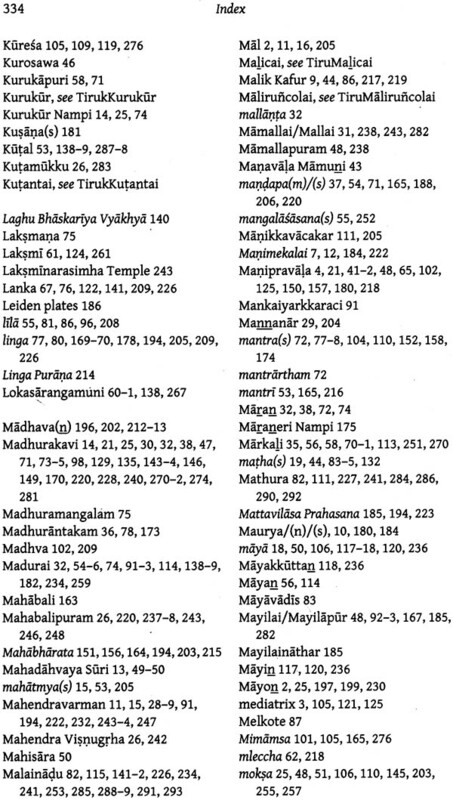 Stotras (praise-poems) composed by various acaryas in Tamil, Sanskrit and Prakrt.